B.A. in American Studies from George Washington University. UJA-Federation of New York; New Leaders of New York Presbyterian Hospital; Harmonie Club in Manhattan. 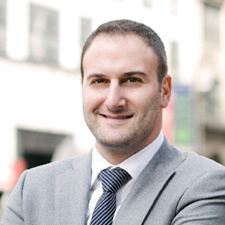 Living in Manhattan his entire life -- with the exception of four years at The George Washington University in DC -- Jonathan has a profound understanding of the local real estate market, making him an ideal adviser to anyone looking to buy, sell, or rent. Jonathan is a people person with an unparalleled work ethic. He always puts his clients’ best interests first, working tirelessly to make sure they find the perfect residence. Whether seeking a first-time home, a new apartment or a vacation property, he will find the perfect opportunities to suit your every need. Jonathan loves to build lasting relationships with his clients, and will go the extra mile to ensure that their entire experience exceeds expectation; from the initial search to move-in day, Jonathan will oversee all details with attention and grace. Jonathan has many favorite pastimes; he is a film buff, an avid cyclist and loves the beach. Philanthropy is also very important to Jonathan; he holds a leadership role with UJA-Federation of New York, volunteers with the New Leaders of New York Presbyterian Hospital, and is an active member of the Harmonie Club in Manhattan. Jonathan is happily married to his best friend, Ethel.